What can be said of the Joe Bonamassa Guitar Collection except impressive! Check out the next guitar Joe might add to his collection that will interest you. I’m thinking there aren’t many people with this size of a guitar collection. Just thinking about it I believe I know of maybe 4 or 5 others maybe more with big guitar collections. And I do mean huge at that. I’ll give you a little more on guitar collectors but thats not what this article is about. These collectors are very common names to most of us all know and follow at one point in our lives. Right off the top of my head there is: Billy Gibbons of ZZ Top, Rick Neilson of Cheap Trick, David Gilmore of Pink Floyd, Marty Stuart, Joe Walsh, Jimmy Page, Tom Petty, Eric Clapton, Keith Richards. Also I’ve heard about this gentleman who isn’t famous by the name of Mike Slubowski who’s collection is said to rival any of the others mentioned. If you want to see a big collection go check out this interview done with Gibson Guitars on the Mike Slubowski Guitar Collection. 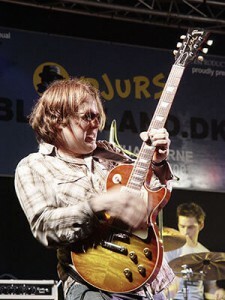 Joe Bonamassa a few years ago was hailed by many as being amongst the Worlds Greatest Guitar Players. He would never admit to that, as I’ve heard him on radio and he’s way to grounded for that. But in my humble opinion he’s one of the Top 10 Guitarist out there as of todays writing. I mean this kat can play. Unlike the guitarist you hear today who have set the bar so low on their knowledge of guitar music/theory etc. which pale’s in comparison to Joe Bonamassa’s. You can tell from his playing that he’s had some training some where. You got to hand to Joe Bonamassa because of the hard work he puts in with a tour schedule that is 200 plus shows this year alone. In today economy that is impressive to say the least. So whether your in the United States, Canada, or Europe there are plenty of shows you can attend. You can always check out his Tour Dates. I wasn’t surprised to find out that Joe is a teacher as well. Now that I do know there will be more research done on his lessons. I’ll see what kind of lessons they are, and what platform they’ll be on. Then hopefully we can add his guitar lessons here on our Famous Teachers page. But till I do, you can always go take a Bonamassa Guitar Lesson yourself. There is nothing that impresses me more that someone who supports the music programs in schools. These programs have been in trouble for awhile now, with no funding and such. Music education is needed in our society today more than ever. 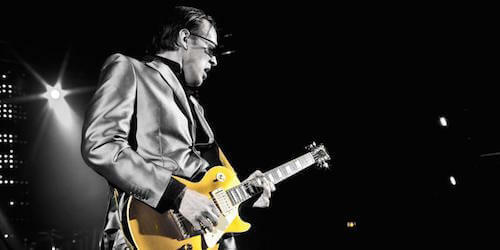 And Joe Bonamassa has stepped up to the plate as an Advocate of Music Education. Joe Bonamassa is the founder of Keeping The Blues Alive. Yeessireey! He’s on the radio folks. Go figure right, I mean where does he find all this time. lol Joe talks guitars on his radio show. With his co-host Matt Abramovits (formally of Sirius Radios Blues channel) they blend a very entertaining show with guitar knowledge, insights into a musician. There’s plenty of information of guitars, guitarist and industry insights as well. And since this is all about Joe Bonamassa playing acoustic guitars, I found the shows 18th episode called Acoustic Apocalypse which you can catch every Friday at The Pickup Radio. 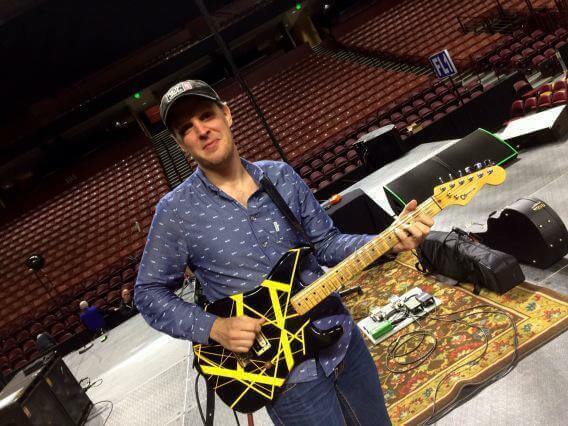 Now Joe Bonamassa has said he is more of a electric guitar guy. But in the video above he clearly knows his way around an acoustic guitar. And in his acoustic sets you see a number of them around the stage. What brands he has I don’t know, but what I do know is he’s a Gibson guy at heart and I do know what that acoustic guitar is in the video. This year in the 2015 NAMM Show D’Angelico Guitars released their new acoustic guitar line with some top of the line acoustics. D’Angelico Guitars contacts Joe to give him one of their guitars and does an interview with Made Man. Oh the lengths we go to get the interview 🙂 or get a guitar in the hands of a guitar master. 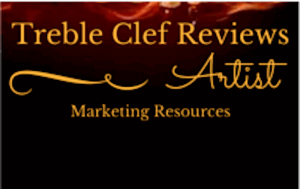 Well there you go, we just included Joe Bonamassa as a Famous Guitarist with us here at Treble Clef Reviews. I’m excited with that. In the video that is a Gibson J-15. If your an avid guitarist looking for one you can get free shipping here. Also the new acoustic line that D’Angelico released the EX-63 series you can also get free shipping here. I hope you enjoyed this as I did and as a final thought, the Joe Bonamassa Guitar Collection just got bigger thanks to D’Angelico Guitars.